has also the responsibility of looking for a new path. 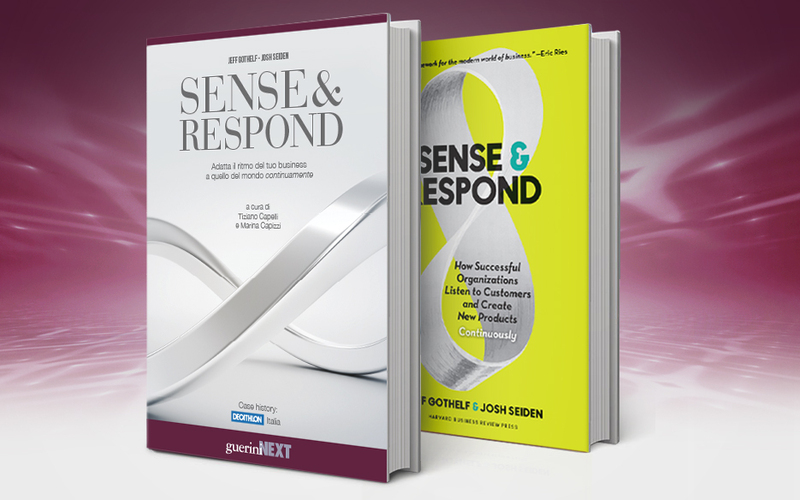 Sense & Respond is an easy but revolutionary synthesis. In fact, through many business cases, it shows how the mindset of many organizations was born during the industrial era. That is over. Nothing is the same, even if it may seems so. We’re in the digital era: a momentous gap, more culturally than technologically. Concepts and methods, that were reference points for generations of managers, don’t work any more: for example, facing uncertainty and complexity with detailed plans. But most organizations still keep on working in the same way as in the past. This book reveals how what we consider an inevitable problem is in fact the result of a deeper and deeper gap between our mental habits and reality. Today’s organisations structures stem from old times. Can a new world come into being without a new framework? Power is tipically concentrated at the top. Is this the best way to meet customers’ needs? Thinking, deciding and acting are part of the same process. What do we gain through separating them? We keep making plans we are unable to keep. Hadn’t we better direct that energy towards the emerging future? Organisations reward mistake avoidance thus strangling experimentation. Is this the best way towards the future? In our organisations a few people say to the many what to do. Is it so surprising that motivation and engagement remain so low? What we get is always less than what we need. Isn’t how we do things part of the problem? Platforms are revolutionising the way producer, consumer and developer meet. Can organisations go on ignoring it? Platforms enabled what organisations couldn’t: integration of stakeholders in the value chain. How about implementing this logic within organisations? Platforms are based on transparency, interaction, cooperation and sharing. Any lessons we can learn? From an architectural point of view, structures can nurture or hinder life and activities. For years we have been choosing people based on skills. Work in an evolving world should be the ultimate place of learning. How come performance evaluation isn’t the number one tool to encourage learning? Our assessments are typically based on skills, aptitudes and motivation. Is this enough to represent the whole person? if all the remaining people don’t tap into their capabilities? Too many e-mails and not enough communication. Meetings are often a waste of time. Why do we still manage them the same old way? Leadership programmes are always intended for bosses. Does centralised leadership still make sense? We create organisational environments no one likes to be in. Isn’t it high time we trusted our desire for well-being? has no room in many lives. Isn’t it the very reason we act? Organizations don’t perceive vocation as being crucial. Are we sure it isn’t connected to profitability? What if we could harness them towards business? There exist needs that don’t recognise themselves as being community. How can we intercept them? Our Headquarter is Spaces Porta Nuova in Milan. We chose a co-working, as the idea of office too needs a complete redefinition. We support mind-set, architecture and processes' evolution, to design a stronger, meaningful way of work together.